Posted on October 2, 2018 by Billy S.
An essential tool for creating smart online forms is Formsite’s Rules. 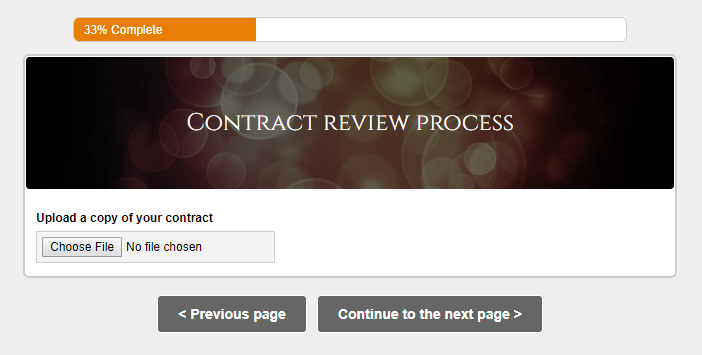 The Rules apply to either form items or pages and makes working with multi-page forms possible. Page rules apply their logic after each page and allow form owners to repeat or skip as needed. The evolution of mobile apps has helped forms and other data collection methods with higher expectations for user experience. Examples include larger text, easier selections and answers, bigger buttons, and less on-screen information. A recent design style that is gaining popularity is the multi-page form, or showing one question at a time. Multi-page forms are easily made with Formsite and page rules help to make them smart. To add pages to a new or existing form, simply drag a Page Break item where you want the page to end and the next one to begin. The Page Break item is found in the form editor under the Formatting Items area. 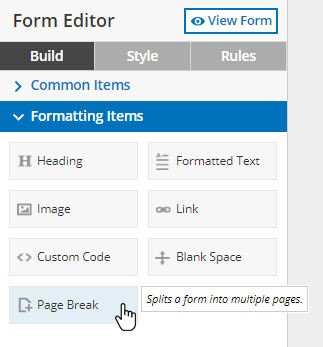 The Page Break item acts like any other item in the form editor. Reposition by dragging and dropping wherever needed, and delete by clicking its delete link. Repeating pages: Collect information on multiple people or events using the repeating pages rule. Set the controller item as a Dropdown item on page 1, then put the repeating page rule after page 2 to repeat based on the controller item, then end on page 3. Skipping pages: Use the skip function for smart forms that only show certain pages based on answers to previous questions. To use, add at least 3 pages to the form, then create a page rule after page 1 to skip to page 3 when the condition is met. Skipping pages removes any answers from the skipped pages. For example, making a process that lets Save & Return visitors return to the form and skip to the end will result in empty pages in between, regardless of any previously-saved answers. Rules are evaluated in order. Once a rule returns true, the action is taken and the rest of the rules are ignored. Do not use a page rule to skip to the next page in most cases. Since the regular behavior is to continue to the next page, only use the skip rule if you have a later rule with a different condition.